Everybody loves a good Christmas party, but school-age children are especially appreciative of merry times. The key for planning a great party is to have plenty of activities and treats to fill up the limited time. Here are some fun and economical ways to lift holiday spirits and entertain students in your classroom: 1. Photo booth Photo: Little Pumpkin Grace Send the kids home with a holiday photo of themselves. 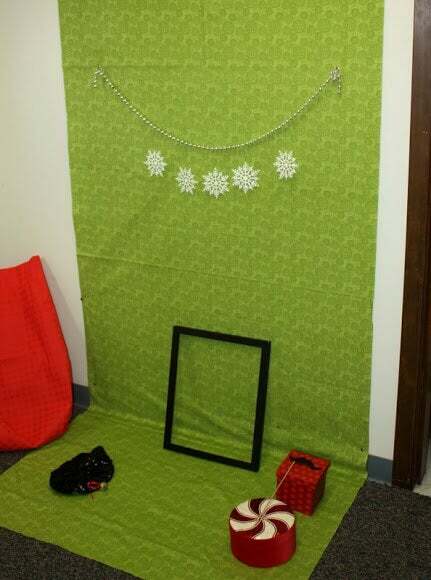 Set up a holiday photo booth at the party to take photos before the party starts. Put up a cheery red or green fabric, drape with holiday beads and snowflakes, and provide an empty frame. After you snap your shots, print out color copies for children to take home as gifts to their parents. 2. 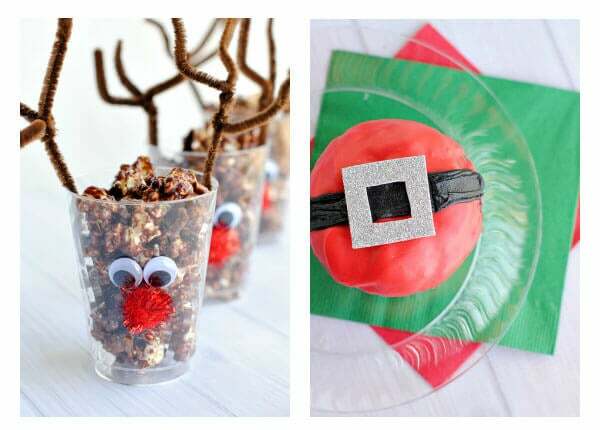 Holiday movie and reindeer popcorn Photo: Crazy Little Projects Pop in a holiday movie like “Elf” and provide students with everything they need to decorate and make reindeer water bottles and popcorn bags while they watch it. Paper lunch bags, clothes pins, tiny eyes, red pom-pom noses and brown pipe cleaners can make healthy snacks fun. 3. 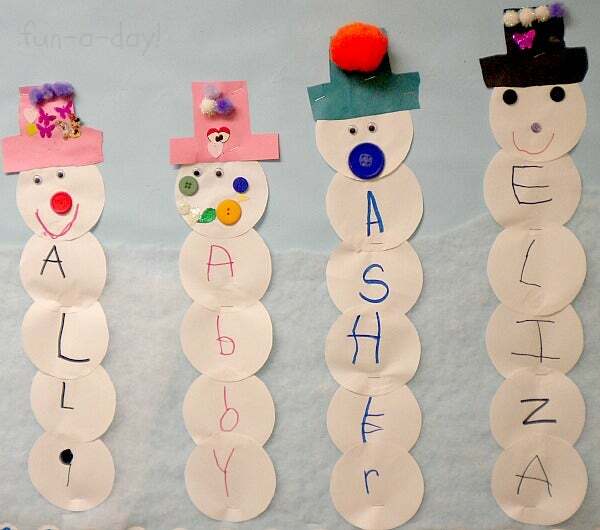 Snowman craft Photo: Fun-A-Day This simple hands-on craft will keep students busy and delighted as they personalize a giant snowman with their name. Gather up white paper plates, poster board letters, construction paper, wiggly eyes, buttons, glue, staples, ribbon and streamers. Glue a letter from the child’s name to each paper plate. Cut out a snowman’s hat from construction paper and attach. Staple the snowman’s body on in order. Add the final touches: scarf, arms, boots, nose, eyes, etc. 4. 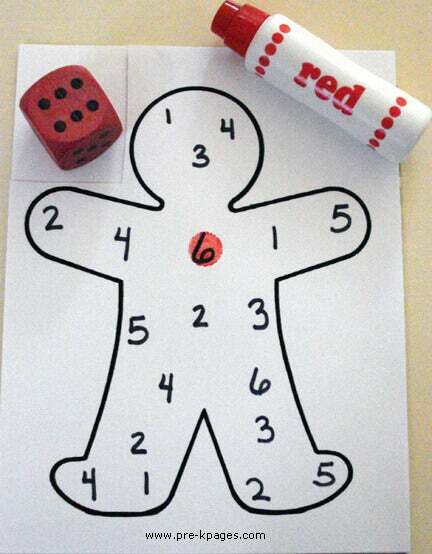 Gingerbread dice game Photo and how-to at Sweet Peas & Bubblebees Provide a gingerbread man cutout marked with numbers and a red marker or crayon. Roll the dice and let the fun begin. The first student to color in all the numbers on their gingerbread wins. Serve gingerbread cookies alongside and let them decorate them with icing after the game! 5. Penguin relay race Photo: Cul-de-sac Cool Game on! 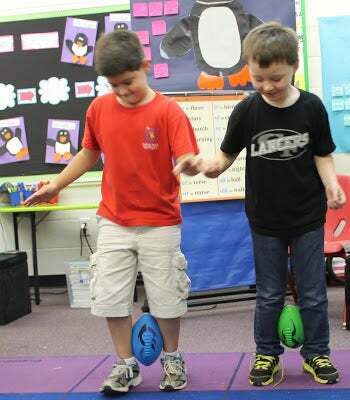 Bring on the laughter when the kids waddle through a game where they look like penguins. All you need is two nerf footballs. Have the children partner-up. The first set of partners must place the ball between their lower legs. From a designated starting point, the two penguins must waddle to the finish line without losing their penguin “egg” that is placed between their calves. If they drop their egg before the finish line, then they must start over again. First person to the finish line wins and then the next group has a turn. 6. Candy cane balance game This holiday game is played in pairs. Place an empty wrapping paper tube on a table or on the floor, and balance a yardstick on top of the tube. Each of the two players has five various sized candy canes. Standing on opposite sides of the yardstick, players must work together to rest all five candy canes on their side of the yardstick without toppling the structure. If the structure falls, the game is over.